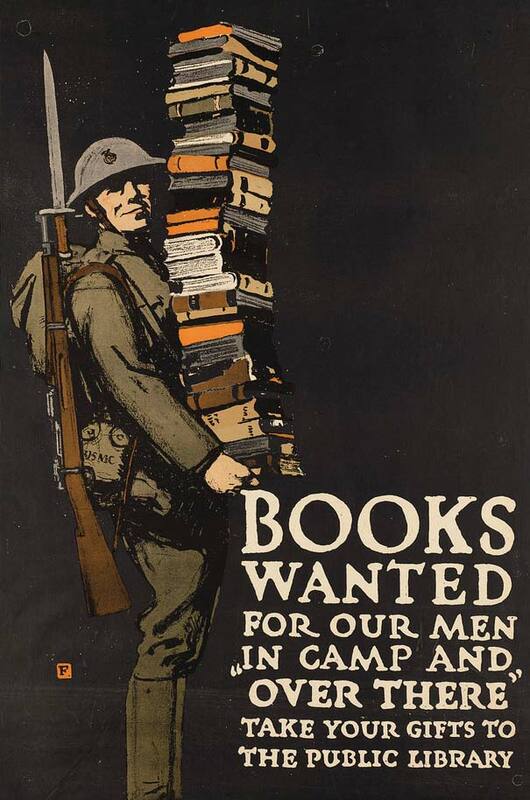 When the United States entered the war in 1917, the president of the American Library Association (ALA) appointed a War Service Committee, where there was a unanimous decision to supply library facilities in the camps of the American Expeditionary Forces. The Secretary of War appointed ten nationally known men and women to a Library War Council in order to raise funds for the construction and outfitting of these library facilities. The council managed to raise nearly $1.5 million in private subscriptions, and a subsequent campaign for books garnered the donation of over two hundred thousand volumes. In addition, the Carnegie Corporation made a grant of $10,000 for each of the thirty-two camp libraries. Many New York publishers added to the books donated and purchased, providing discounts of 45-50% off book prices, and major university presses also donated their publications. The following is the tale of how the books arrived in France. The systematic work of the A.L.A. for the American Expeditionary Forces began in January, 1918, when a Dispatch Office was established at Hoboken for the purpose of assembling books and shipping them on transports. The books sent in this way were placed in Y.M.C.A. huts or distributed directly to the men themselves. The granting of this request and the provision by the Quartermaster Department of a warehouse for the reception of books from the transports, whence they might be distributed at will, made it possible to begin work on an extensive scale. 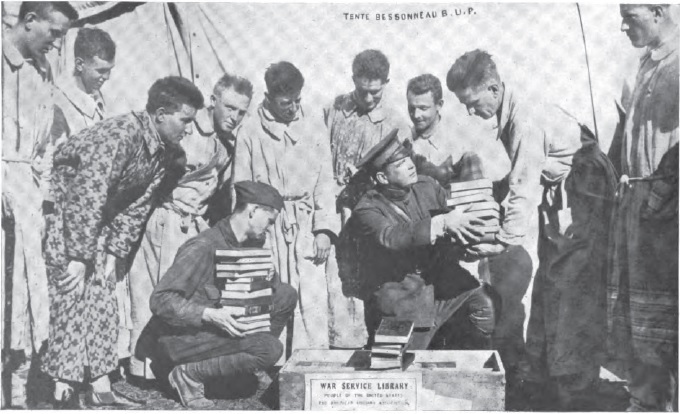 The Fourth of July was suitably celebrated by the delivery of seventy-five books to each of the American hospital trains in France, and as rapidly as possible selected libraries were established in each of the base and camp hospitals for the use of the boys who had been sent down from the front line. From that time on, books and magazines went everywhere. They were used in the front-line trenches by the man on duty and while waiting for the order to go over the top; in the reserve areas just back of the front; in huts and other places of shelter; in the training camps where the men recently arrived were being fitted for transfer to the front; in the disintegrating areas; especially in the rest camps in the few days of regular surcease from advance operations; at the bases where great establishments grew up at the point of debarkation, and at the more isolated places where the foresters and engineers were working. The aim was to furnish any books the men wanted, whether technical publications, reference works, or standard fiction, and to furnish them at the time when they were wanted. Records taken at random from the file at Headquarters show that at one of the main huts 492 books were used 972 times during the first ten days of the service, and the circulation was limited only by the fact that there were seldom any books on the shelves. Magazines were for trench usage, non-returnable. In the zone of advance the unit of library service was the Division, no matter over how wide an area it might be spread or through how many villages it might extend. While the Y.M.C.A., the Knights of Columbus, and the Salvation Army aimed to get a hut in at least the chief villages, the A.L.A. found it more feasible to send its books to the divisional center, from which they could be properly distributed. When the Division moved, the books could be returned to the central warehouse of the organization through which they were being circulated, unless the area was being abandoned. Permanent Headquarters were opened in Paris in April, 1918. In August larger quarters were secured at No. 10 Rue de l’Elysee, in a building leased from the proprietors by the Y.M.C.A., which uses the upper floors for its educational and allied departments, leaving the entire ground floor and basement at the disposal of the A.L.A. The basement is used for packing and stock-rooms, while the arrangement of the ground floor resembles that of the average small library, — entrance and charging desk in the center, reading-room on one side, reference-room on the other, and stack-room in the rear. Here the administrative offices of the overseas service were established, in charge of Mr. Burton E. Stevenson, the novelist and librarian of Chillicothe, Ohio, and a central reference and circulating library of about ten thousand volumes was started. This library proved very popular with the men in the Paris district. On Sunday afternoons, especially, they crowded around the big open fires to read, or moved quietly about among the bookshelves, hunting for favorite volumes. To further the overseas work additional dispatch offices were established in the United States, at Newport News, Boston, Philadelphia, and New York. Every available means of getting books to France was used. The Army tonnage provided for about one hundred thousand volumes monthly, twenty-five thousand volumes were sent over on American Red Cross tonnage, and the deck shipments on transports in charge of Y.M.C.A. secretaries added appreciably to the total. The records show that up to February 1,1919, a total of one million eight hundred thousand volumes had been shipped to France, and that libraries had been established in six hundred and thirty-eight Y.M.C.A. centers, in forty Knights of Columbus centers, in forty-one Salvation Army centers, in twelve Y.W.C.A. centers, and in five Jewish Welfare Board centers, as well as with a number of miscellaneous welfare organizations, such as the Moose, the American Soldiers’ and Sailors’ Club, and the like. Each section of the American Ambulance Service had been given a book collection; similar service had been extended to the Americans in the Polish army and the Mallet Reserve, and two hundred and sixty-four military organizations in the A.E.F. had been provided with libraries. By March, the number of books sent overseas had passed the two million mark. Books were sent not only to France but also to the American troops in England, Italy, Archangel, and Vladivostock, and to American prisoners in Germany. At Aix-les-Bains, the recreation center for the Army, where there was boating, baseball, athletics, Lieutenant Europe’s famous band, and a theater, the A.L.A. had a well-rounded collection of books in the Y.M.C.A.’s casino, with a trained librarian in charge. In order to provide for members of the A.E.F. on their voyage home, and also to forestall any necessity for draining out of France the books now there, all transports are equipped in American ports with adequate permanent libraries, to remain on board as long as the transport is in service.